A variety of wildlife uses the El Capitan Cave for shelter. River otters follow a scent trail to find their den in the darkness. Otter tracks are sometimes visible and their fur can be seen on the gate. Two species of brown bats seek shelter in the cave during the winter. Small cave-adapted organisms such as amphipods, collembolans and mites are found in the small pools. 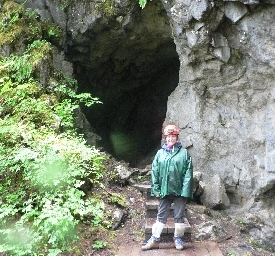 Bears have used the cave for thousands of years, with remains of brown bear dating back over 12,000 years. Wolverine, caribou and red fox fossils have also been found. A 370-step staircase leads to the cave entrance. USDA Forest Service naturalists will point out signs of wildlife use and answer questions about how wildlife uses the cave. Caves are fragile and dangerous areas, and independent visits to El Capitan are not allowed. The USDA Forest Service runs free naturalist-guided cave tours in the summer (reservations required). Call the Thorne Bay Ranger District at 907-828-3304 to reserve a spot. The trailhead for El Capitan Cave is on FH 15, near the intersection with FH 20. There are a few directional signs for the cave along FH 20.